Back in the 1980’s, Marty McFly and Doc Brown painted an interesting picture of what our future would look like in the 1989 film “Back to the Future II.” As you may recall, the popular first film ended with our heroes getting ready for a trip into the future, with Doc notoriously quipping, “Where we’re going, we don’t need roads.” In the second film, we were thrown into a world of futuristic expectations of what life would be like with regards to our homes, clothing, and yes, even transportation. That far-off future date was October 21, 2015. The dates from the “Back to the Future” series, including today. So just where are we now with regards to Marty’s experience of transportation in 2015? Which predictions hit the mark, which were way off, and what technology are we currently using that not even the popular film could predict? In the 1980’s it seemed logical that our technological focus would be getting the personal vehicle off the ground and into the air. Suburban sprawl was on the upswing, the US had survived the decade of the 1973 oil embargo, safety became a priority when seat belts became mandatory and the federal government began to enforce the Clean Air Act standards for cars. Also, the Jetsons had been telling us for years that we’d be flying our cars to work. 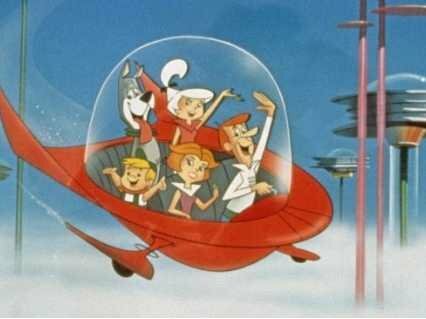 We may not have flying cars in 2015, but the Jetsons promise we’ll be flying to work by 2062. But all is not lost. For the past century people have been trying to create a flying car, with some rather science-fiction-looking results that make the DeLorean, Doc’s legendary time-traveling car, look downright old-fashioned. Today one of the closest models we have is this Aeromobile 3.0, the Slovakian innovation that can fly 544 miles and travel at 124 mph. And for hundreds of thousands of Euros, and a wait of 2-3 years, you could own your very own flying car. 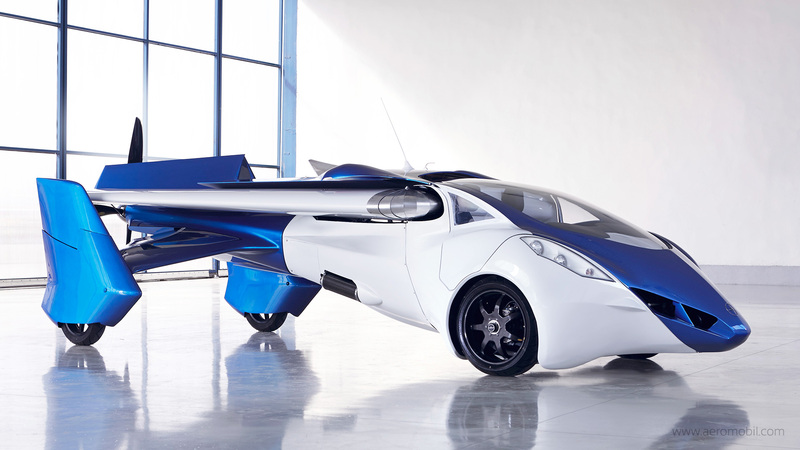 The Aeromobile 3.0 is one of our best options for flying cars. For those of you needing to be airborne sooner (and cheaper) than that, we can look towards the hoverboard as our mode of transport for the future. While they aren’t yet cruising the sidewalks of our cities and towns, we may be a little closer to seeing them strapped to the feet of Millennials (or, more likely, that scary and unknown Generation Z). The Hendo Hoverboard uses Magnetic Field Architecture technology to give users the thrill of levitating on a skateboard. And for just $10,000 you can be one of the first to purchase one. But you’ll also have to buy your own magnetic surface to place down anywhere you want to use it; the Hendo Hoverboard unfortunately won’t work on just any surface, or actually really any surface that you would realistically like to travel on. But with their scheduled release today, this tech is that much closer to our reach. The Hendo Hoverboard, yours for only $10,000. Don’t pay for gas, just use trash! 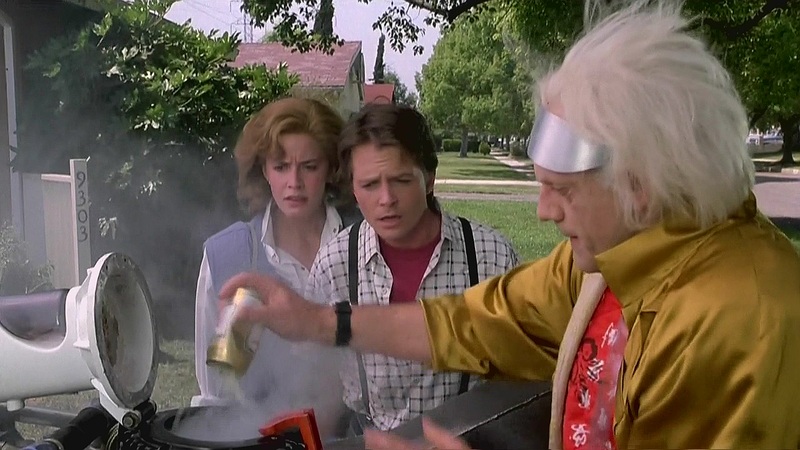 According to Doc Brown, our vehicles would be fueled by trash rather than gasoline in the year 2015. Using nuclear fusion, Mr. Fusion the Home Energy Reactor would convert household trash items, such as banana peels and soda cans, into the energy needed to power the DeLorean. Though far from the dependency we currently have on oil (despite best efforts to promote electric and hydrogen cars — more on that later), this tech may be closer than you think. Biogas, the product of converting organic material into methane, is used in Sweden and California to power trash collection vehicles. 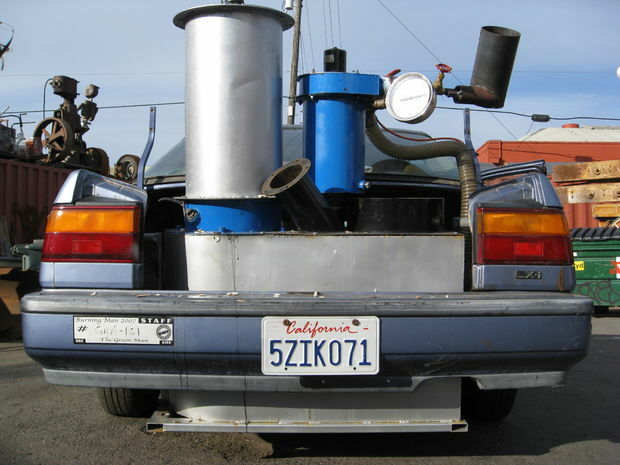 And if you feel so inclined, you can even modify your personal car into a trash-converting vehicle using the open source Gasifier Experimenter’s Kit. Adapting your car into a trash-converting vehicle looks pretty easy. All of this would have been good news since the film’s expectation for gas prices were more than 3 times the cost they are today. In 1985 (the year “Back to the Future” takes place) a gallon of gas cost approximately $1.09. Today, it’s more than doubled to $2.32 (and that’s a far cry from last year’s average of $3.13). But according to the film, 2015 gas prices were a whopping $6.95. Perhaps that was to pay for the robot that would pump your gas, or for any of the other gas station services envisioned such as mag-lev adjustments, aero-dynamic kits and certified retro-fitting services. 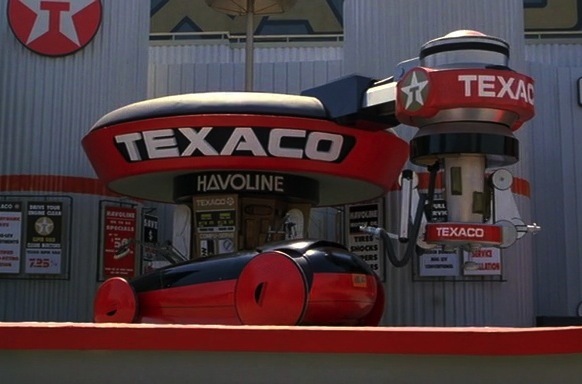 Robotic gas stations mean you never have to leave your car. We obviously don’t have pumps that look like this, but they could be arriving at a gas station near you sooner than you think. A Missouri company is producing robotic gas pumps that use infrared lights, cameras and good old-fashioned suction cups to open your car’s fuel door. It will cost your neighborhood gas station $50,000 a pump, but isn’t that really worth the ability to never have to leave your car to purchase gas again? So we don’t get to work via flying cars or hoverboards, robots don’t pump our gas, and for the most part trash can’t fuel our cars. Disappointing though 2015 may seem, there are some transportation innovations we take for granted that not even Doc could have predicted. Google was just a funny sounding word back in the 1980’s, but today the company is leading the way in autonomous vehicles. Their self-driving cars have been on the road since 2009, and four states and Washington DC have passed legislation allowing these cars to be on public roads (but don’t worry, they currently are capped at a speed of 25 mph). 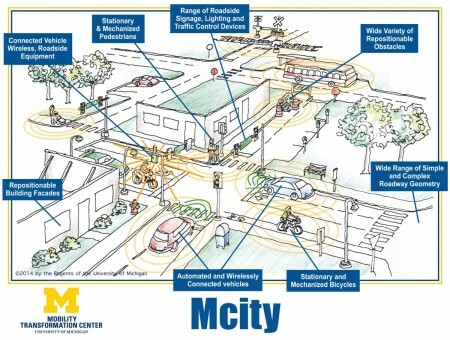 Michigan is not only one of these states, but is home to the Mcity Test Facility, a 32-acre research complex at the University of Michigan with realistic road conditions for testing autonomous vehicles. Though still in a rigorous testing period, Google may have these vehicles ready for public purchase by 2020. Mcity, where the autonomous vehicle is King. Garbage trucks may be the premier vehicle using trash for fuel, but that doesn’t mean that there aren’t alternatives out there. Back in 1976 Congress recognized the need to invest in alternative fuel vehicles and passed the Electric and Hybrid Vehicle Research, Development, and Demonstration Act. But in the mid 1980’s electric vehicles weren’t on the radar for many car buyers and it wasn’t until the 1990’s that the interest in developing the technology to make electric vehicles possible really flourished. Today electric and hybrid vehicles are available through the majority of automakers with over 25,000 such vehicles registered in Michigan. Leading car manufacturers are putting their trust in the public’s interest in this technology. Toyota announced just this week its goal to reduce CO2 emissions from new cars by 90% by 2050.They plan to do this through their hydrogen vehicle the Mirai and their hybrid vehicle the Prius. (And if that’s not enough to get you Back to the Future fans excited, check out this add for the Mirai featuring Michael J. Fox and Christopher Lloyd). Add this to the already ambitious plans of Tesla to sell 500,000 electric vehicles (at $35,000 each) by 2020, and we could be seeing an entirely new standard for the personal car very soon. Paying for a taxi was another transportation scenario where the film anticipated a large change. 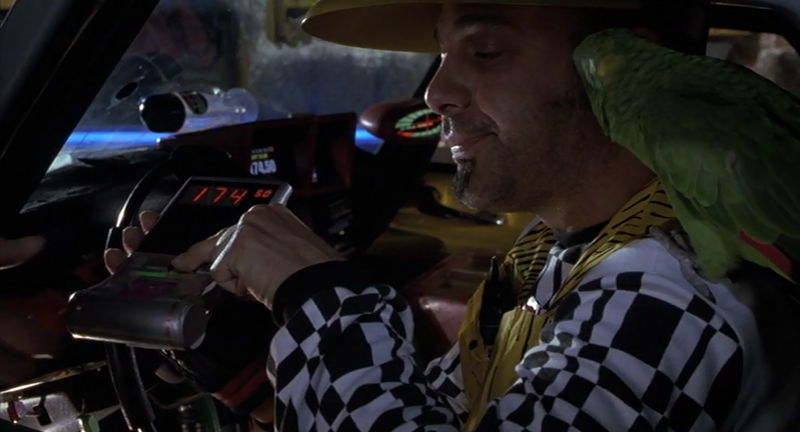 But though those character living in their 2015 wouldn’t think twice about paying $174.50 for a taxi ride (or using their thumb print as their bank card), they probably would be flustered over flagging down a ride using an app through Uber or Lyft (and to show just how much of a fan Lyft is of Back to the Future, the company is offering a chance for a free ride in their DeLorean vehicles in Manhattan today from 11:00 am until 5:00 pm. Please, if you’re in NYC today, take advantage of this opportunity!). This tech-savvy approach to choosing exactly what type of vehicle to pick you up and when is a much more customizable way to get to your destination, and sure beats whatever policies would have allowed for taxi drivers to use their Parrots as a driving aid. Taxis are always more reliable with parrots. ← 80 MPH: Is Michigan Putting Speed Before Safety?